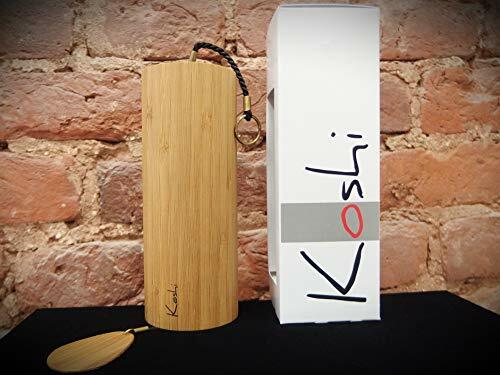 Koshi Terra wind chimes The Koshi chime is an authentic musical instrument, an original creation of high quality. Hand made in our workshop at the foot of the Pyrenean mountains, each chime is the result of meticulous craftsmanship.Eight chords are welded with silver into the metal plate at the base of the resonance tube. Precise tuning creates a play of clear tones that is rich in overtones. The overtones of the shorter chords gradually dominate and become fundamentals, thus forming a circular tone range. Move the chime gently holding it by its cord: the crystalline relaxing sound may leave you in quiet wonder. Suspended, it will play with the wind and carry you away in an unexpected melody. Aqua: Features: unique and very beautiful sound filled with harmony and peace, relaxation effect Purpose: for children and adults Learning game: very simple for you to play the wind Material: bamboo, steel Size: 163x65x65 mm Tuning: Terra (♪♫ G C E F G C E G) Color: light brown Packing box included Made in France. Sound example: shamanic.ru/muzykalnye-instrumenty/koshi/ Your order will be securely packed and shipped to you as soon as possible by airmail worldwide after payment is received. Then we will notify you the Tracking number to track your parcel. Delivery Service: Russian Post Tracking happens before the border and customs zones. Next, go to the website of your national postal service and track a package. International shipping usually takes 6-14 days, in remote areas the delivery may take 20 days. If you have any questions about this product by koshi, contact us by completing and submitting the form below. If you are looking for a specif part number, please include it with your message.